A Jacobean equivalent to a roller coaster ride full of ups, downs, twisting turns, and imminent head-chopping moments, the tragicomic romance relies on characters purposed to fill slots. 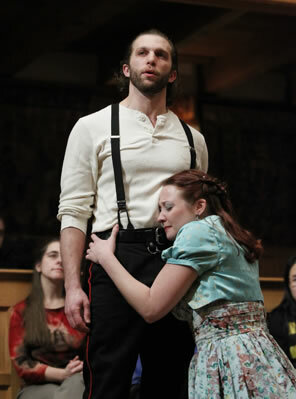 Sarah Fallon as Arethusa hugs Gregory Jon Phelps as Philaster at the Blackfriars Playhouse. Photo by Tommy Thompson, American Shakespeare Center. First a disclaimer: I’ve seen a lot of Shakespeare, and I’ve read Shakespeare a lot; not so much his contemporaries, and I’ve never read nor seen Philaster before. All I knew of the play before seeing it at the Blackfriars Playhouse was that scholars believe it either influenced or was influenced by Shakespeare’s Cymbeline. Certainly, similarities exist, most intriguingly the role of Dion in Philaster and the Second Lord in Cymbeline, both of whom make comically disparaging asides throughout the play. Most other similarities between the plays seem, to me, more to do with shared form than stolen content. That's my opinion from watching this production of Philaster as carried off by the Actors' Renaissance Season company with ease and affection. Cymbeline has some fine poetical moments and a couple of memorable characters, but this Philaster came off as a much more entertaining play. While it had more than its fair share of heartbreaking moments, it also had non-stop intrigue and some extraordinary speeches. Beaumont and Fletcher clearly had some skills in composition (the latter had enough skill for Shakespeare to collaborate with him on three plays). If there’s any 400-year-after quarterbacking to be leveled at Beaumont and Fletcher, it was the choice of genre they made their specialty: tragicomic romances with whimsical, fairy-tale-like plots and archetype characters. Let’s start with the plot. Philaster is the prince of a Sicilian king who was usurped and murdered before the play by the despotic King of Calabria. However, because the people so love Philaster, Calabria lets him live free. Meanwhile, the king aims to marry off his daughter, Arethusa, to Pharamond, a prince of Spain, who will then become ruler of Calabria and Sicily. But Pharamond is a over-preening fool, and Arethusa and Philaster love each other, so Philaster sends his page, the boy Bellario, to serve Arethusa until they can work out marriage plans. Pharamond is caught in a dalliance with one of Arethusa’s gentlewomen, Megra, who then counters her own comdemnation by accusing Arethusa of having sexual relations with Bellario. Seeking to head off Philaster from scandal, his trusted advisor, Dion, repeats Megra’s accusation to him and claims to have seen the illicit act, to boot. Philaster turns away both Arethusa and Bellario, Arethusa turns away Bellario, and both again turn away the distraught Bellario in subsequent scenes to tighten our heartstrings all the more. When a distraught Arethusa escapes the court, she, Philaster, and Bellario chance to meet in the forest, fail at a suicide pact and subsequently are found, each bearing wounds, by the king and his lords. As Philaster is accused of assaulting Arethusa, he finally comes to his senses and realizes he was wrong about both Arethusa and Bellario. Though Calabria sentences Philaster to death, he and Arethusa secretly marry; so Calabria sentences his own daughter to death, too. The people finally revolt and capture the Spanish Prince Pharamond, and the king asks for and receives Philaster’s assistance in quelling the rebellion. All are reconciled except that Megra publically presses her accusation that Arethusa had sexual relations with Bellario, whereupon Bellario reveals himself to not only be a woman but the long-lost daughter of Dion. Got all that? Ridiculous as it sounds on paper (or, rather, on your computer or tablet screen), it works on stage—much like a typical daytime soap opera, which is, essentially, a modern version of the tragicomic romance. A Jacobean equivalent to a roller coaster ride full of ups, downs, twisting turns, and imminent head-chopping moments, the tragicomic romance relies on characters purposed to fill slots. For example, the title character is the epitome of a brave, upright, ever-courtly hero (played with spirited bravado by Gregory Jon Phelps); Arethusa is the epitome of the spirited, chaste, ever-courtly heroine princess (played with enthusiastic innocence by Sarah Fallon); Bellario is the epitome of the pure, inwardly noble and ever-true page (played with heart-breaking resonance by Miriam Donald); the king is the epitome of the despotic but conscience-ridden ruler (played with majestic frustration by René Thornton Jr.); and the Spanish Prince Pharamond is the epitome of the cowardly but deviously dangerous villain (played with a full-of-himself hilarity by Aidan O’Reilly, a great comic turn by this versatile actor). Nevertheless, Beaumont and Fletcher embed deep in the verse certain subtleties in these portrayals, and the American Shakespeare Center cast, as ever, adeptly dug deep into their lines to find their characters’ singularly quirky personalities (and in the Actors’ Renaissance Season, they did this without a director and on only a few days’ rehearsal using cue scripts). The consummate example was John Harrell’s portrayal of Dion, one of three Sicilian lords attending on the king. His asides to the audience and gibes with his fellows showed him to be wary of the king, watchful for his fall, and constant to Philaster (a constancy that causes him to mistakenly extend Megra’s accusation of Arethusa). All the while Harrell’s Dion displayed an enthusiastic wit and a wry sense of humor. Upon the people capturing Prince Pharamond, King Calabria worried “What they will do with this poor prince, the gods know—and I fear.” “Why sir,” Dion put in gleefully, “They’ll flay him and make church buckets o’his skin to quench rebellion, then clap a river in’s sconce and hang him up for a sign.” This normally would be a clown’s comment, not a lord’s, but Harrell called on his inner clown to deliver the line through his lord’s demeanor, making the delivery all the funnier. Despite his near-fatal fault of repeating Megra’s accusations to Philaster and claiming firsthand knowledge of its veracity, Dion carries the play’s moral lessons in his interactions with the king. When the king rails at all those who failed to find his runaway daughter and demanded to know if whether, he being king, should then be obeyed, Dion replies, “Yes, if you command things possible and honest.” “‘Things possible and honest’?” repeats the king. “Hear me, thou, thou traitor that dar’st confine thy king to things possible and honest: show her me, or let me perish if I cover not all Sicily with blood!” To this despotic threat, Harrell’s Dion coolly replied, “Faith, I cannot, unless you tell me where she is.” Thornton’s king could hardly contain himself, and became even more remonstrative: “Go, bring her me and set her here before me. ’Tis the King will have it so, whose breath can still the winds, uncloud the sun, charm down the swelling sea, and stop the clouds of heaven. Speak, can it not?” Harrell wasted no time delivery Dion’s reply: “No.” So matter-of-factly did Harrell deliver this single-word line that the audience first drew in its breath at his audacity, and then laughed at Thornton’s just-as-incredulous king who, literally in a word, saw all his presumed power evaporated. Philaster has many such moments that make this a play worth reading and viewing again and again. Even if Beaumont and Fletcher created a title character who was a little too one-dimensionally heroic, Phelps brought true passion and a visible sense of betrayal to his lines that made the audience want to get up there and convince him he's been misled and his love has been belied. Even if Beaumont and Fletcher made Bellario just a bit too pitiful and wrote two scenes too many with the only purpose of plucking the audience’s heartstrings, Donald played the part so truly that our heartstrings nonetheless were plucked in even the two excess scenes. No matter if this came before or after his Cymbeline, Shakespeare was probably just as impressed watching his own company performing Philaster in his Blackfriars theater as we were watching the American Shakespeare Center do it in their replication of that same Blackfriars. Whether it was Shakespeare’s plays or those of other playwrights, The King’s Men knew a good thing when they had it. In the hands of the ASC’s men and women, this was a good thing. During the Actors’ Renaissance Season, the actors are not only required to come up with their own characterizations based on their texts but also costume themselves. This performance and the matinee performance of A Mad World, My Masters earlier in the day exemplified how much effort the actors put into their responsibilities. In A Mad World, Allison Glenzer, otherwise playing a sweat-suit-wearing, Snooki-like prostitute’s mother for most of the play, doubled as Jasper, a servant who appears in one scene and speaks a total of 12 lines. She made herself up as a balding elderly man wearing a butler’s suit, and spoke with the pitch and cadence of an old, tired servant, so unrecognizable that the gentleman sitting next to me began rifling through his program to discover which actor was playing this part. In Philaster, Jeremy West played the captain of the citizens who capture the Spanish Prince Pharamond. For this single scene he donned one of the Falstaff fat suits from the theater’s wardrobe stock and wore a bulbous nose. This time it was my wife who wondered which actor was playing the part, though we’ve seen West on this stage many times before. With a 12-person troupe performing these plays, many of the actors double, triple, and even quadruple roles, and sometimes a part is no more than a quick entrance, a line or two, and a just-as-quick exit. However, despite the time and concentration required to mount these plays among themselves, the actors invest whatever it takes to make sure each of their characters, however long their stage life, is singular and memorable. It’s a testament to not only the actors’ skills but also their devotion.